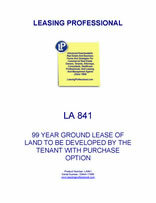 This 99 year ground lease contemplates development by the tenant, and contains both an option to purchase the land and a landlord put option to sell the land to the tenant in certain circumstances. A number of exhibits pertaining to the ground lease are also included. This GROUND LEASE is made as of _________________, by and between COMMERCIAL PROPERTY LANDLORD, INC., a __________________ corporation ("Landlord"), and AGREEABLE TENANT, INC., a _________________ corporation ("Tenant"). Base Rent. The term "Base Rent" means the base rental, defined as such and set forth in Article 4. Commencement Date. The term "Commencement Date" means the date on which the Term commences, defined as such and set forth in Article 2. Excluded Personal Property. The term "Excluded Personal Property" means any and all furniture, fixtures, equipment and other personal property, including without limitation, replacements and substitutions therefor, and all leases thereof and all rents, revenues, income, profits, royalties, deposits and proceeds therefrom, now or hereafter owned, leased or used by or through Tenant and/or any Excluded Property Party and their respective successors, assigns, and /or transferees. Excluded Property. The term "Excluded Property" means the Improvements, Pre-Existing Improvements and all Excluded Personal Property. Excluded Property Party. The term "Excluded Property Party" means Tenant, any person or entity occupying or using any part of the Improvements or Premises by or through Tenant (or its lessees, successors or assigns) and/or any person or entity holding an ownership or security interest in any Excluded Property. Gross Profits . The term "Gross Profits" means all rents, income and profits arising from leases, permits or agreements relative to the use of the Premises and/or Improvements by Tenant, Landlord (or its affiliates) or by third parties. Impositions. The term "Impositions" means the taxes, assessments and other rates, levies and governmental charges, defined as such and set forth in Article 5. Improvements. The term "Improvements" means the buildings and improvements now located on the Land, or hereafter constructed or erected on the Land, including all improvements that were either constructed by Landlord as agent for and for the account of Tenant or by or through Tenant for Tenant's own account in accordance with the Plans and Specifications in anticipation of the Lease, as well as any future additions, replacements, or alterations thereto, and any attachments, appliances, equipment, machinery, and other fixtures attached to said buildings and improvements or otherwise located on the Premises other than the Pre-Existing Improvements. Land. The term "Land" means the parcel of land described in Exhibit A attached hereto and by this reference made a part hereof and the easements, rights, and other appurtenances now or hereafter appurtenant to, benefiting or serving such parcel including the land lying in the bed of any street, alley or highway in front of, within or adjoining the land described in such Exhibit but not including any Improvements or Pre-Existing Improvements. Landlord. In addition to the meaning ascribed to the term "Landlord" in Section 20.5 here of the term "Landlord" means the Landlord named herein and any person, firm, corporation or other legal entity who or which shall succeed to Landlord's legal and equitable fee simple title to the Land (any such successor to be conclusively deemed to have assumed the obligations of "Landlord" herein by virtue of such succession). Landlord Mortgage. The term "Landlord Mortgage" means any mortgage granted or made by Landlord to grant to a Landlord Mortgagee a security interest in Landlord's interest in the Premises and/or in this Lease and shall include whatever security instruments are used in the __________ metropolitan area to secure such interests including without limitation, financing statements, security agreements, mortgages, deeds of trust, and any other documentation required to so secure such interest. Landlord Mortgagee. The term "Landlord Mortgagee" means the holder or secured party under a Landlord Mortgage. Leasehold Mortgage. The term "Leasehold Mortgage" means any leasehold mortgage granted or made by Tenant to grant to a Leasehold Mortgagee a security interest in Tenant's leasehold interest in this Lease and shall include whatever security instruments are used in the __________ metropolitan area to secure the mortgagee's interest in the leasehold interest of Tenant under this Lease without limitation, financing statements, security agreements, mortgages, deeds of trust, and any other documentation required to so secure such interest. Leasehold Mortgagee. The term "Leasehold Mortgagee" means the holder or secured party under a Leasehold Mortgage. Lease Year. The term "Lease Year" means each successive twelve month period during the term commencing on the Commencement Date. Permitted Encumbrances. The term "Permitted Encumbrances" means only the encumbrances described in Exhibit B hereto. Plans and Specifications. The term "Plans and Specifications" means the plans and specifications dated ______________ prepared by __________________ for the project. Pre-Existing Improvements. The term "Pre-Existing Improvements" means any improvements located on the Land at such time as the Landlord acquired title to the Land (e.g., sewer lines). Premises. The term "Premises" means the Land and any Pre-Existing Improvements. Tenant. In addition to the meanings ascribed to the term "Tenant" in Section 20.5 hereof, the term "Tenant" means the Tenant named herein, and any person, firm, corporation or other legal entity to whom or to which Tenant's interest in this Lease shall be assigned. Section 2.1 Demise. Landlord hereby leases to Tenant the Premises situated in the City of ____________ , County of __________ , State of _________, and described more fully in Exhibit A attached hereto and by this reference made a part hereof. TO HAVE AND TO HOLD the Premises unto Tenant and its successors and assigns, from the Commencement Date and continuing thereafter for the remaining term of this Lease (the "Term"). Section 2.2 Term. The parties acknowledge and stipulate that the Commencement Date of the Term occurred on ______________ , and that Tenant unconditionally accepted the Premises on such date. Unless otherwise renewed or sooner terminated as provided herein, the Term shall continue until, and expire at, 11:59 p.m., Eastern Standard Time, on ____________ (the "Expiration Date"). As used herein, "Term" or "term" shall mean the initial 99 year term and any Renewal Term under Section 2.4 hereof. Section 2.3 Lease Not Terminable Except as Provided Herein. Except as otherwise expressly provided for herein, this Lease shall not terminate, nor shall Tenant be entitled to any abatement, diminution, deduction, deferment, or reduction of rent, or set-off against the Rent, nor shall the respective obligations of Landlord and Tenant be otherwise affected by reason of any damage to or destruction of the Premises by whatever cause; any taking by eminent domain or eviction by paramount title (except to the extent this Lease is effected by operation of law); any lawful or unlawful prohibition of Tenant's use of the Premises; any interference with such use by any private person, corporation, or other entity; any default or breach of any warranty by Landlord under this Lease; any inconvenience, interruption, cessation, or loss of business, or otherwise, caused directly or indirectly by any present or future laws, rules, requirements, orders, directions, ordinances, or regulation of the United States of America or of the state, county or city government, or any other municipal government or lawful authority whatsoever or by priorities, rationing, or curtailment of labor or materials or by war or any matter or thing resulting therefrom; or for any other cause whether similar to or dissimilar from the foregoing, any present or future law to the contrary notwithstanding, it being the intention of the parties that the obligations of Tenant hereunder shall be separate and independent covenants and agreements and that the Rent and all other payments to be made by Tenant hereunder shall continue to be payable in all events unless the obligations to pay the same shall be terminated pursuant to the express provisions of this Lease. Section 2.4 Option to Extend Term. Tenant shall have the option to extend the Term for one (1) additional period of ninety nine (99) years (the "Renewal Term"). In order to exercise this option to extend, the Tenant must so notify Landlord in writing not later than twelve (12) months prior to the end of the initial Term. All terms and conditions of this Lease shall remain in full force and effect during the Renewal Term, except for Base Rent, which shall be adjusted as provided in Section 4.1 hereof. Section 2.5 Option to Purchase Premises. (a) Tenant shall be entitled to elect, and Landlord hereby grants Tenant the option, to purchase the entirety of the Premises, to be exercised at any time during the term of this Lease on not less than sixty (60) days and not more than twenty-four (24) months' prior written notice to Landlord, at a price equal to the Fair Option Value (defined below) determined as of the date of exercise of the option. Tenant's notice of exercise of the option shall be deemed and shall constitute an irrevocable acceptance by Tenant of Landlord's irrevocable offer to sell and convey the Premises to Tenant. (b) If Tenant shall exercise its option to purchase the Premises, the closing on such option and the conveyance by Landlord to Tenant of the Premises (the "Closing") shall take place on such date designated by Tenant in its notice of exercise but no later than two (2) years after the date of exercise of the option. In the event Closing shall be scheduled to occur after expiration of the Term, the Term shall be automatically renewed on a month-to-month basis until Closing occurs, on the same terms and conditions as are then in effect, including the scheduled adjustment of Base Rent under Section 4.1. On the date of Closing, Landlord shall convey the Premises to Tenant or its designee in the amount of the Fair Option Value determined as of the date of exercise of the option. Landlord shall convey to Tenant by quit claim deed, all right title and interest, if any, of Landlord in and to the Improvements, and shall further convey to Tenant the Premises by special warranty deed , covenanting and warranting against claims of Landlord or those claiming by, through or under Landlord, and transferring marketable fee simple absolute title to the Premises, subject only to this Lease, to all state of facts an accurate survey would show, to taxes and assessments, to zoning regulations and public rights of way, the Permitted Encumbrances and to other encumbrances placed of record with the consent of Tenant; provided however, Landlord shall have no duty to discharge any lien or encumbrance created by, through or under Tenant, but Landlord shall cause any and all mortgage or deed of trust liens affecting Landlord's fee ownership of the Premises to be paid and discharged at Closing. Landlord shall also execute and furnish Tenant with a standard "owner's affidavit" so as to enable Tenant to obtain an owner's policy of title insurance at Closing, without exception, as to Landlord's acts only, for mechanic's liens, rights of parties in possession and such other matters as may be covered under the standard title company affidavit for owners. In connection with the closing or incidental to the conveyance of the Premises, Tenant shall pay any and all recording costs, and Landlord and Tenant shall each pay one-half of any escrow fees charged by Tenant's title insurance company and closing escrow agent, but otherwise Landlord and Tenant shall pay their own respective costs. At the option and election of Tenant to be exercised in writing at the closing, the Lease may be terminated effective as of the conveyance of the Premises. There shall be no adjustments for real estate taxes and assessments or for any other costs or charges payable by Tenant under the Lease. Closing shall occur at the offices of a national title company designated by Tenant located in __________ County. All other closing matters shall be handled in accordance with the standard closing practices of the title company. (c) For purposes of this option to purchase the Premises, it is expressly understood and agreed that the term "Fair Option Value" shall mean the greater of (x) $_____________ or (y) Fair Market Value of Landlord's title to the Land comprising part of the Premises with such Fair Market Value of the Land to be determined as if the Land were not improved and were unencumbered by this Lease. Tenant's estimate of the Fair Market Value shall be supported by a written appraisal prepared by an appraiser who is an Member of the Appraisal Institute ("MAI") having not less than fifteen (15) years experience in the appraisal of commercial real estate in __________ County. In the event Landlord shall not agree with the Fair Market Value as so determined by Tenant's appraiser, Landlord shall so notify Tenant in writing within thirty (30) days from receipt of Tenant's advice as to the Fair Market Value (such notice to include a written appraisal prepared by an MAI appraiser having not less than fifteen (15) years experience in the appraisal of commercial real estate in __________ County. If Landlord and Tenant are unable to reach agreement within thirty (30) days after the date of Landlord's response to Tenant, then the issue of Fair Market Value shall be submitted to binding arbitration conducted in accordance with the Commercial Arbitration Rules of the American Arbitration Association ("AAA") or a similar arbitration mechanism if AAA is no longer in existence. Each party shall pay the fees and expenses of its appraiser and one-half the fees and expenses of the arbitrator.